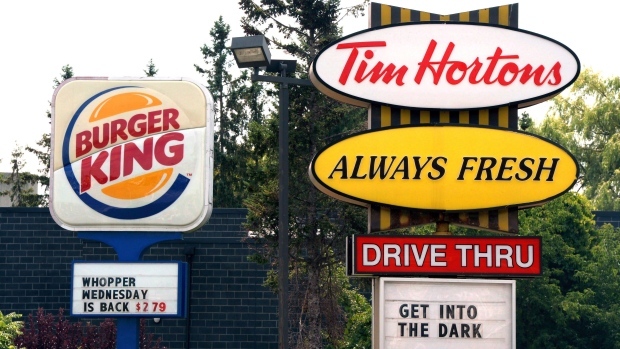 When Tim Hortons was acquired by Burger King owner 3G Capital in late 2014, the company’s new owners had big plans to make the coffee chain as ubiquitous south of the border as it is in its home base of Canada. But with crowded competition in the fast-food space and tensions with its franchisees, Tim Hortons is pulling back in some of its biggest U.S. markets, threatening to stall its American expansion efforts, according to documents obtained by BNN Bloomberg. Tim Hortons’ overall U.S. outlet store count has declined by 14 per cent over the past three years while most of the U.S. states it operates in, including its bigger markets of New York and Ohio, reported falling average gross sales, a sign that Tim Hortons’ U.S. efforts have yet to fully catch on, according to documents that outline its U.S. franchise performance for prospective store owners. Tim Hortons has been under pressure in recent years amid brewing tensions between franchisees and parent company Restaurant Brands International Inc. (QSR.TO) since the coffee-and-doughnuts maker was taken over by 3G, a Brazilian private equity firm that merged it with Burger King to form the larger company. Members of the Great White North Franchisee Association, which claims to represent at least half of Tim Hortons franchisees in the U.S. and Canada, have complained about a range of issues including hikes in supply deliveries, cost-cutting measures and mismanagement of marketing funds. Meanwhile, the company faces stiff competition from the likes of McDonald’s Corp. and Starbucks Corp., which have expanded their menus to include more food and specialized coffee items in recent years. Under Restaurant Brands’ ownership, the company shrunk its total store count by 50 outlets in the U.S. last year, opening 30 stores while closing 80, the documents show. Most of the shuttered stores are located in New York and Michigan. Tim Hortons operated 738 outlet stores in the U.S. by the end of 2017, down from 857 outlet stores at the beginning of 2014. Last month, Tim Hortons shut down its only store in Indianapolis, Ind. after just four months of operation, while another four Indiana locations under development are awaiting a final decision from Restaurant Brands, according to regional developer Luke Brands. Meanwhile, average gross sales in seven of the 11 U.S. states it operates in have declined year-over-year. In New York, where Tim Hortons has its biggest U.S. presence with 257 stores, average gross sales declined 3.4 per cent in 2017 from the year prior, while the company reduced its footprint by 39 stores, according to the internal documents. In Ohio, the company’s third-biggest U.S. market, Tim Hortons’ documents show year-over-year average gross store sales fell 5.4 per cent after it opened five stores in the state while closing four. “As with any business, from time to time we may close some restaurants in the ordinary course of business,” said Tim Hortons President Alex Macedo in an emailed statement to BNN Bloomberg. Macedo said Tim Hortons has experienced “softer comparable sales growth” in the U.S. in recent quarters given its competitive restaurant market. “We are working closely with our restaurant owners to adjust the balance of our menu across value offerings and product innovation to improve our results,” he said. Restaurant Brands stopped breaking down how its Tim Hortons operations perform in the U.S. and Canada respectively in its quarterly financial statements at the end of 2016, instead lumping it into system-wide figures and providing scant details of how the company broadly operates in Canada. The company said in its internal documents that it continues to seek prospective franchisees throughout the U.S. and expects to open between 20 to 50 new franchised stores in the current fiscal year. However, in a similar document released in March 2017, the company noted it plans to open between 70 to 100 new franchise stores in 2017, ultimately falling short of those projections. Tim Hortons first entered the U.S. in 1984 with a store in Tonawanda, New York, slowly expanding to about a dozen stores, mostly near the U.S.-Canada border, when it merged with burger giant Wendy’s International to create North American’s then-third largest fast-food conglomerate in 1995. By the time Wendy’s spun off Tim Hortons into a separate company in August 2006, it had 270 stores in 10 U.S. states. The battle over where you eat breakfast is heating up as McDonald’s launches a plan to offer bagels at locations in Canada. BNN Bloomberg's Jon Erlichman explains. According to a report from Veritas Investment Research Corp., in 2016 the average sales volume per store of a Tim Hortons restaurant in Canada is about $2 million a year, compared with $1.2 million in the U.S. Given that low return on investment of U.S. Tim Hortons stores, Restaurant Brands management switched to using low-cost area development agreements that offer local partners exclusive development and sub-franchise rights, with full control over local procurement, supply chain, and marketing, to expand in the U.S., according to Veritas analyst Kathleen Wong, in an email with BNN Bloomberg. But the company also had some difficulty in securing area development partners, with some suing the company for allegedly breaking development agreements. Tim Hortons is currently involved in at least 11 lawsuits pending throughout the U.S. court system, the company’s documents show. Scott Korzenowski, a Minnesota-based lawyer who represents Show-Me Hospitality LLC, is suing Tim Hortons’ U.S. subsidiary for allegedly breaching its area development contract. Korzenowski said Tim Hortons changed terms of a contract by hiking the number of standard shops the developer had to open over a five-year span in the St. Louis, Miss. area to 200 from an originally agreed upon 50 stores. Tim Hortons declined to comment on its current legal proceedings against Show-Me Hospitality.